Dental fractures are commonly observed with other oral injuries. Early recognition and management can improve tooth survival and functionality. Approximately 82% of traumatized teeth are maxillary teeth. Fractures to the maxillary teeth are distributed among the central incisors (64%), lateral incisors (15%), and canines (3%). See the image below. The typical cause is severe force to the teeth sufficient to disrupt the enamel, dentin, or both of a tooth. In a study of 1610 children, predisposing factors included postnormal occlusion, an overjet exceeding 4 mm, a short upper lip, an incompetent lip, and mouth breathing. More than 50% of physical trauma in child abuse occurs in the head and neck region. In a study conducted in Sweden, approximately 7% of all physical injuries involved the oral cavity. In patients aged 0-19 years, 9% of injuries involved the oral cavity. During the Korean War, 3000 maxillofacial injuries occurred. Trauma to the teeth is not life threatening; however, associated maxillofacial injuries and fractures can compromise the airway. In trauma with mandibular fracture, the teeth in the upper jaw may be at higher risk than teeth in the lower jaw. Morbidity to the teeth may be individualized to primary and permanent teeth. Fractures are more common in permanent teeth; primary teeth usually become displaced. The average age of injury varies. In youths, falls and sporting activities account for most injuries. In later teenaged years, motor vehicle collisions (MVCs) account for most injuries. Lieger O, Zix J, Kruse A, Iizuka T. Dental injuries in association with facial fractures. J Oral Maxillofac Surg. 2009 Aug. 67(8):1680-4. [Medline]. Blagojevic D, Petrovic B, Markovic D, Vujkov S, Rihter ID. 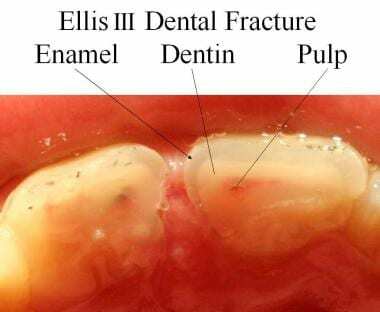 Pulp vitality preservation after traumatic dental injuries to permanent teeth. Med Pregl. 2013 Mar-Apr. 66(3-4):149-52. [Medline]. Lopes Albuquerque CE, Nogueira Arcanjo FP, Cristino-Filho G, Mont'alverne Lopes-Filho A, Cesar de Almeida P, Prado R, et al. How safe is your motorcycle helmet?. J Oral Maxillofac Surg. 2014 Mar. 72 (3):542-9. [Medline]. Cini MA, Prado BG, Hinnig Pde F, Fukushima WY, Adami F. Influence of type of helmet on facial trauma in motorcycle accidents. Br J Oral Maxillofac Surg. 2014 Nov. 52 (9):789-92. [Medline]. Bakland LK, Andreasen JO. Examination of the dentally traumatized patient. J Calif Dent Assoc. 1996 Feb. 24(2):35-7, 40-4. [Medline]. Cvek M, Mejare I, Andreasen JO. Conservative endodontic treatment of teeth fractured in the middle or apical part of the root. Dent Traumatol. 2004 Oct. 20(5):261-9. [Medline]. Devlin DH. A historical review of dental and facial skeletal trauma. J Calif Dent Assoc. 1996 Feb. 24(2):29-34. [Medline]. Gutmann JL, Gutmann MS. Cause, incidence, and prevention of trauma to teeth. Dent Clin North Am. 1995 Jan. 39(1):1-13. [Medline]. Harwood-Nuss A, Linden C, Luten R, eds. Dental injuries. The Clinical Practice of Emergency Medicine. 2nd ed. Philadelphia: Lippincott Williams & Wilkins; 1996. 418-421. Josell SD. Evaluation, diagnosis, and treatment of the traumatized patient. Dent Clin North Am. 1995 Jan. 39(1):15-24. [Medline]. Josell SD, Abrams RG. Traumatic injuries to the dentition and its supporting structures. Pediatr Clin North Am. 1982 Jun. 29(3):717-41. [Medline]. Krasner P, Rankow HJ. New philosophy for the treatment of avulsed teeth. Oral Surg Oral Med Oral Pathol Oral Radiol Endod. 1995 May. 79(5):616-23. [Medline]. Rosen P, Barkin R. Dental emergencies. Emergency Medicine Concepts and Clinical Practice. 3rd ed. St Louis: Mosby-Year Book; Vol 3: 1992: 2381-2398. Trope M. Protocol for treating the avulsed tooth. J Calif Dent Assoc. 1996 Mar. 24(3):43-9. [Medline].